It all started with my mom buying some cured cucumbers at a Russian deli one day. They're called Malosolnie Ogurtzi, meaning lightly salted. It's not pickling, it is salt curing. Just like you would with a salmon, for example. The cucumbers my mom got were gherkins, and tasted completely wrong. They had a strange metal taste, which was not pleasant of course. My father, after complaining loudly over the wrong taste, described what these cucumbers supposed to taste like. I was intrigued, and started digging for a way to make my own. I brought a batch to my parents yesterday, my father approved. He said mine tasted exactly like they're supposed to: crunchy, lightly salted, and fresh. 2 lbs (1Kg) of Persian Cucumbers. Make sure they're all the same thickness and length. I buy mine at Trader Joe's, they come prepackaged and are already of uniform size. *make sure the herbs are completely dry after washing. Trim the ends off the cucumbers. Cut them in half. Place them inside a large Ziploc bag. In a bowl, mix together salt and sugar (I use a form for mixing, I found it a lot better for mixing in the herbs than a spoon). Then mix in rest of the ingredients. Make sure that the salt and sugar mixture completely and evenly coats the herbs. You are looking for a consistency of a dry rub. Add the mixture into the bag with cucumbers. Seal the bag, making sure to squeeze out all extra air. Gently massage the mixture into the cucumbers, so they're all evenly coated. Place in the fridge. I make mine around dinner time, then flip the bag onto the other side before going to bed. They're ready in the morning the next day. The cucumbers will give a little when squeezed and the bag will be filled with light-green brine. 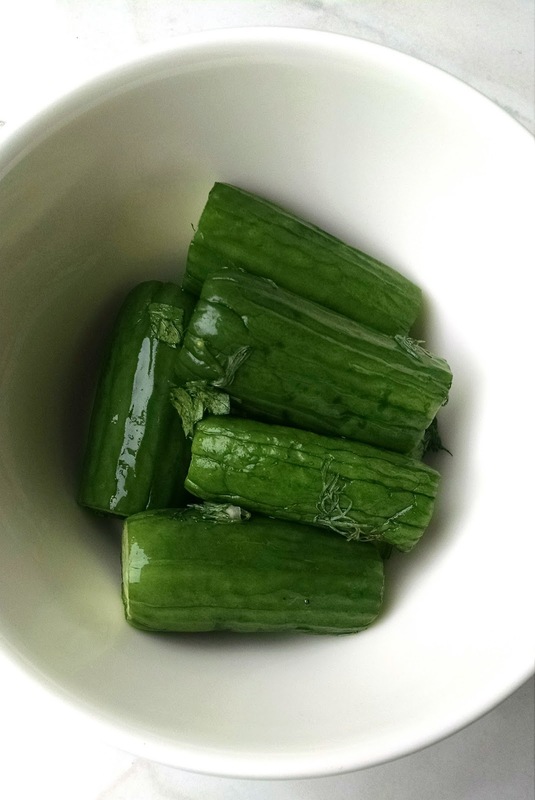 Rinse the cucumbers in a colander under cold water, keep in a tight container in the fridge. The cucumbers should taste salty (but not too salty), crisp and crunchy. If they taste too salty, soak them in cold water for about a minute to balance out the salt content. I assume they would last in the fridge for a while, only in my house they're all gone in about two days. Best served as part of Zakuzki, Russian appetizers spread. Tiny finger bites, lots of pickled things like herrings, caviar, top shelf vodka chilled to perfection. etc. Let's save that for another post, shall we? Chilling with Peter Thomas Roth's Cucumber De-Tox De-Puffing Eye-Cubes. Now you can finally eat all your cucumbers while saying bye-bye to tired eyes that announce to everyone that you had one too many summer beverages the night before. Considering to take a shower with St. Tropez In-Shower Tanner. What? I don't have to stand like a cross while I wait for the self tanner to dry? Count me in! Although I read that you still smell like potatoes. Geeking out over the new LG G4 phone. It's got the best phone camera on the market. But really, it's not about the camera, it's about the case. Come on, the back's made out of leather! Logitech Keys-To-Go iPad keyboard. It has mechanical keys and it feels like a keyboard. Pretty sure it will go home with me when I shop for school supplies. Now I can carpool and write my novels at the same time. Waiting for the September Issue of Vogue. You can pre-order it on Amazon and it'll arrive in a nifty white box. But mine will arrive in August, because I'm obsessed and have a subscription. Do I still get the white box?